Spain said on Thursday it would begin the process of imposing direct rule on Catalonia by activating Article 155 of the country's constitution. Catalonia's leader, Carles Puigdemont, said the region's parliament would vote to formally declare independence if Spain continued "repression". So what do the press in Madrid and Barcelona have to say on the issue? El País, Spain's highest-circulation newspaper, centre-left and unionist, says the move is "essential as a result of Puigdemont's blackmail". The Catalan leader's response was an "unequivocal and flagrant violation of the constitutional order", it declares, leaving the government with "few choices left". The Madrid-based daily argues that triggering Article 155 "does not imply suspending or annulling [Catalonia's] autonomy" but "rescuing it from those who have hijacked it for their own objectives". El Mundo, Spain's second most read newspaper, conservative and unionist, says "Puigdemont would like the show to go on indefinitely." "The government could ask him a thousand times if he has declared independence or not, and he would continue stalling," it says. "Patience and political flexibility also have limits, especially when those stalling for time threaten co-existence and economy." 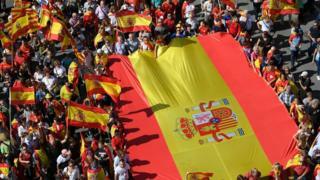 It points to "the backing of the international community, especially the EU" which Spain enjoys in the dispute. However, El Punt Avui, a Catalan-language newspaper which is solidly separatist, asserts that "different European and world institutions, and political and social agents" have called for "dialogue and an agreed outcome". Arguing that "the most democratic solution to the current situation would be a proclamation of independence", it accuses the Spanish government of creating an "unknown scenario" and "aiming to humiliate the enemy". "The opportunity of dialogue is, for now, on hold", the Barcelona-based paper concludes. Ara, a Catalan-language newspaper which backs independence, accuses the Spanish government of not taking "the time to read Mr Puigdemont's letter carefully". "They used what they considered a threat to move forward measures which empower Madrid to obligate the Catalan authorities to abide by the constitution," it says. It will be difficult to find a solution the paper argues, as the Spanish government "does not understand the scope of the problem". Prime Minister Mariano Rajoy, it argues, has acted "more like a pyromaniac than a fire fighter throughout the conflict", creating a "nightmare for other European governments" want a "quick solution".